The pride of Llano, Texas football , Kenneth Gray didn't turn a lot of heads upon the completion of his high school career. As a two-way tackle at Howard Payne University however, he helped new coach Benny Williams enter the Lone Star Conference and played at an All Conference level for a mediocre team that finished at 3-6 his senior year. His obvious talent found him drafted by the Packers in the sixth round in 1958, but he was immediately shuttled off to the Chicago Cardinals where he played both offensive tackle and linebacker. By the time the Cardinals had moved to St. Louis in 1960, Gray had settled in as a full time offensive guard and at 6'2", 245 pounds, teamed with tackle Ken Panfil to pave the way for Cards halfback John David Crow to rank as the number three rusher in the NFL with 1071 yards. 1960 was also the first year of the Cardinal logo. For 45 years the now famous logo still sits on the side of this franchise's helmet. Until recently, the logo has changed very little. 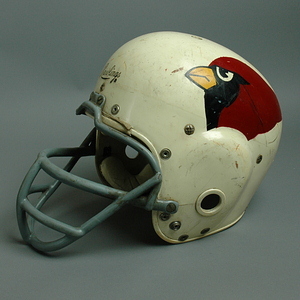 One of the most significant changes was in 1961 when the Cardinal logo was applied by using vinyl material. 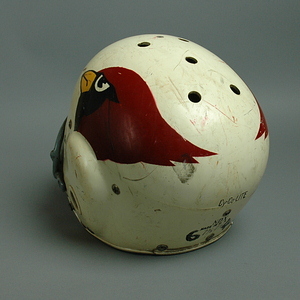 The 1960 Ken Gray helmet above used a 3 step stenciling process to paint the cardinal logo on the shell. 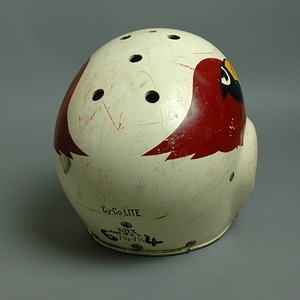 Gray, along with many of the St. Louis Cardinal players used the Cy-Co-LITE NDX Rawlings helmet, with state of the art "Head Cushion" suspension technology. 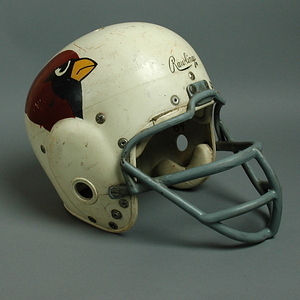 Though the Cardinals were 4-9-1 in '62, Gray was named to his first Pro Bowl team and with the addition of Ernie McMillan to the offensive line, Gray led the pass protection for quarterbacks Sam Etcheverry and Charlie Johnson that was so efficient that St. Louis receivers Sonny Randle and Bobby Joe Conrad ranked numbers two and three in receiving for the season. 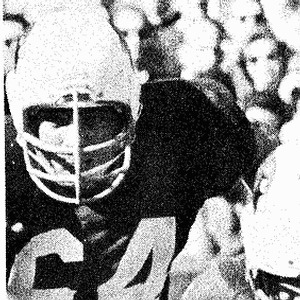 Gray was always a steady force at guard throughout his entire career, a craftsman who revisited the Pro Bowl in 1964, '65, and '67 through 1969. He completed his career in his native Texas in 1970, playing with the Houston Oilers and retiring as a member of the Howard Payne University Hall Of Fame and one of the finest Cardinal linemen of all time.